Starting out with a small rant here, but WTF, Frontier Airlines?!! But anyway, Erika and I arrived in San Diego safely, met Deb, and went straight to a local Mexican joint for margaritas (margarEEEtas)! We visited with some seals of Oceanside, checked into the condo [which was really nice minus the train that ran just outside the window at frequent intervals all throughout the day and night!] and took a walk around town. This picture just does not do the waves justice! Friday morning, we decided to head down to the beach and see about this whole swimming in the ocean thing. Getting out past the waves made us all a little nervous, and I think all three of us stood there about knee-deep in the water unsure of how to tackle this part of the swim. Erika was asking about which point in the wave to start diving under, so in an effort to show her, I dove into one of the waves. It actually wasn't so bad! Now that I'd gotten started, I kept going and soon found myself past the worst of it. I turned around and saw Erika was not too far behind me, so I waited, and the two of us swam out to almost the end of the pier. Then we started wondering how safe it was for us to be out there alone (are there sharks in this water?? ), and decided to turn back. The swim back into the shore was actually way worse, as we couldn't see the waves coming up on us, and we were both happy that the official swim would end in a harbor, so we wouldn't have to worry about that part again. After a shower and breakfast, we spent the rest of the day exploring Lake Hodges. We were hoping for a good hiking trail, but settled for a brief trek up to the top of a cliff, and then a walk part-way around the lake. Then it was off to a winery for the rest of the evening, and a soak in the hot tub when we got back to the condo. Saturday, we had to somewhat take it easy in preparation for the swim on Sunday morning, but did find some energy for testing out some of the demo Xterra SUP in the harbor at swim check-in, and a walk around the shore of Pacific Beach to watch the sunset. Sunday morning. Swim day! Yikes. Erika had been nervous about the event for most of the trip, and I think nervousness is contagious! Deb decided to switch her registration to the 1.2 mile swim, and so now I was the only fool swimming 2.4 miles, and was wondering if I was making the right decision? Our practice swim on Friday was hard, but I got through it, so I was determined to do the 2.4 miles as I'd planned, especially since I figured as long as I could get out to the first turn buoy, I'd be fine. The three of us made our way down to the pier and said our goodbyes as Deb and Erika caught the shuttle down to the 1.2 mile start (different start points, but we would end in the same spot). I put my wetsuit on, applied my trislide and sunblock, turned in my morning clothes bag (to be collected at the end) and, for better or worse, was ready to go. My original goal for the swim was 1:40, but given the waves and the current, I had no idea what to expect.. maybe 2 hours? I lined up on the beach with all the other swimmers, and let pretty much everyone run ahead of me when the horn (err.. ambulance siren) sounded. Let me just say that the waves were nothing like they were during our practice swim!! Not only were they much bigger, but they were much more frequent! We never got a break, and I was getting pounded again and again [and again and again]. I was about a heartbeat away from flagging down a kayaker and throwing in the towel, but I didn't see any around me. Swimming back to shore was even more terrifying, so I just kept side-stroking my way out. I had to stop again at one point to fix my timing chip that I could feel coming off (tucked it into my wetsuit). Finally, I got to that first buoy and I hit the lap button on my watch so I could later see just how long and pathetic that first section took me. Once I was around that first buoy, I figured things would get better, right? Wrong. The waves weren't breaking anymore, but they were just as big and frequent as ever. I couldn't see any of the buoys and I was starting to get seasick from being tossed around so much. I tried to swim as best I could, and at one point a kayaker cut me off and told me I was going way off course. I must say that the volunteers were pretty incredible! At some point, I stopped, and another kayaker asked if I wanted some water. Considering all of the salt water I'd consumed on accident, water sounded great. A lifeguard paddled over to me and let me hang on to her surfboard until another boat came over with some water. Unfortunately, it wasn't water, but instead some hammer product that tasted disgusting, but at least it got rid of the salt water taste. I checked my watch and was pleased to see that I was more than halfway. OK, I can do this... I was off again, trying desperately to spot the buoys. The volunteers kept trying to direct me, and it turned out I was further along than I thought... I was no longer looking for orange buoys. I had made it to the green buoys, indicating we were close to the turn into the harbor. Eventually, I found myself rounding the rocks into the harbor. I really started to pick it up at this point and was cruising! I was passing people handily and just swimming along. Then, a freaking seal swam right under me, about 2-3 feet away! It freaked me out for a second until I realized what it was, but how cool is that?! It was going the opposite direction as me though, so I couldn't follow it. My arms started getting tired at this point, but I was enjoying my pace and was able to keep it up until the end. I was looking for the large blow-up rubber ducky that I thought was supposed to signal the finish, but never saw it. Instead, there were a ton of people yelling and cheering and I found myself at the boat launch. They gave out burritos at the end... also, note the distance recorded!! I swam as far as I could b/c I hate touching the bottom of bodies of water and wanted to be sure I didn't have to walk too far. Suddenly, I found a hand in front of my face and I happily let the volunteer help me to my feet and direct me to the timing mats about 15 feet away. 1:47 was the time on my garmin (official time listed as 1:47:01), and under the circumstances, I'll take it! It was a strong finish and also a personal best for me at the distance! It took a minute to get myself oriented as I walked through the finisher chute, and I had to hold onto the railing as a volunteer removed my chip. It took forever to find some water -- not sure why they didn't think finishers would want water right away? Then I found Deb and found out that she and Erika had only finished 10 minutes earlier, so I was happy I didn't make them wait for too long for me. We took a finisher photo, and decided to buy t-shirts to commemorate the occasion. From there, it was a relaxing day of brunch and sitting at the pool, before going out to dinner with my family who lives in San Diego. It was great to see them and a wonderful finish to the weekend! on this trip, the baby was really, really good and pretty much slept the whole time. Oh.. and that top right photo? They wouldn't even let us watch the tv's while we were waiting! Then.. traveling home was the worst nightmare ever. When we booked our flights, [I thought] Deb was scheduled for a flight that left after mine and Erika's, but something must have happened because, Deb said her flight was now at 11:15, which meant we had to get to the airport at 9am. This was a full 3.5 hours before our scheduled flight, which was already delayed thanks to many flights needing to be re-routed to avoid Chicago air space (thanks, jackass). So, we had to wait until 10:40 until we could even check in, and then another few hours until our flight to Denver finally took off around 1:30. When we landed in Denver, we raced to the food court to grab a snack for the flight (heath bar crunch cookie!) and made it back just in time for boarding, only to find out our captain and first officer had timed out. We had to get off the plane again while they found a new crew. Then they had to re-route us again to avoid weather in parts of the country. Then there was too much fuel on the plane. Then the new captain timed out. Then... we finally pull back from the gate as though we're leaving, but takeoff is aborted halfway down the runway due to a flight control malfunction. It was literally one thing after another, and we didn't end up landing in DC until 5:30am, a full 7.5 hours late (not sure why they didn't just cancel the flight?) and over 18 hours of travel for me and Erika. Thanks to Jon, my hero, for tracking the flight and still picking me up when I finally made it. Never again, Frontier airlines, never again. When I got home and uploaded my data, I found the most shocking thing. That first segment out through the waves to the first buoy that I was just sure took forever was actually faster than the rest? I'm confused. Really confused. Chaffing on my shoulder from my wetsuit.. I swear, I use body glide, but every single time the wetsuit gets me! All in all, this was a successful weekend. I now know that I can swim this distance, even in poor circumstances. I am now officially in my off-season, and getting ready to head south to Key West this weekend! I already promised Jon that I am not taking any athletic equipment, no running shoes, no goggles, no garmin.. this will be a purely relaxing weekend, and I cannot wait! 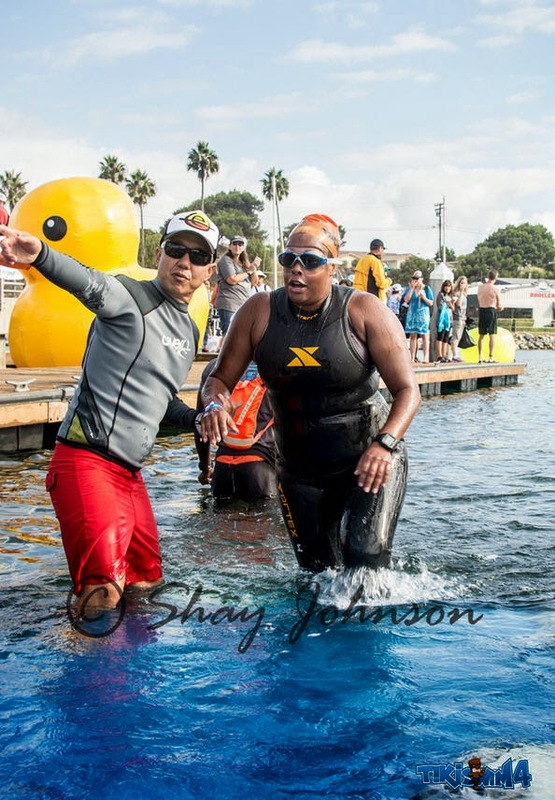 I stumbled upon another race report from someone who has done this swim for the past couple years, and described it as the hardest OWS he's ever done, with "a lot more swells and chop than the previous two years." It makes me feel much better that this was so hard for me. Seems like conditions were much worse than they have been in years past. His garmin also measured 2.6 miles, so maybe I didn't swim as far off course as I thought; the course was just long.